I’m a Windows/Linux guy myself these days, and my Zoom H4 works great with both operating systems. But apparently Zoom H2 and H4 digital audio recorders didn’t play too nicely with the latest operating system update from Apple. Well, for a few minutes anyway. 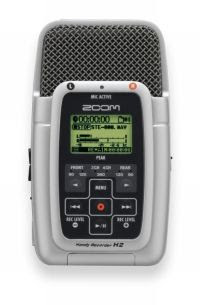 Zoom has issued updated firmware for both recorders and now all is right with the world. The issue had to do with connecting your Zoom flash recorder to a Mac to transfer files. Sure, you could pop out the SD card and stick it into a card reader, but where’s the fun in that? And on the Zoom H4 at least, the card/battery cover feels pretty flimsy, so if you ask me, the less often you have to open it, the less likely it is to break. If you don’t have a Mac or haven’t upgraded to OS X 10.5 Leopard yet, there’s probably no reason to grab the H2 update. But the H4 update also includes a fix for a problem that caused distortion when using effects in the 4 track recording mode. You can get the H2 update here and the H4 update here. Actually, most of the changes you mentioned came in the Zoom H4 2.0 update released a few weeks ago. The latest update is primarily about Leopard compatibility.